NEW Under the Sea App: FREE through 12/11! Under the Sea is an educational app based on our Underwater Encounters series. Designed by Playrific for the iPad and iPhone, Under the Sea provides brain-boosting interactive activities and interesting, educational facts about many different varieties of sea creatures. Children can read mini-books accompanied by audio narration, sharpen their minds with memory matching games and jigsaw puzzles, flip through libraries of gorgeous underwater photgraphy, and express their creative side with coloring activities! There are even short video clips of sea animals in their natural habitats! With thirty sea-creature-related activities, your children will get hours of education and entertainment from this app, helping them to meet Common Core Standards for understanding information presented via diverse media! Click Here to Download from iTunes! The app has five screens of activities, with six activities per screen. 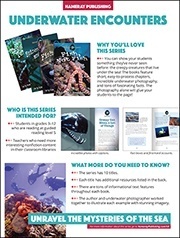 There are six types of activities (hear-and-read, matching, jigsaw puzzles, coloring, video, and photo libraries) and there are five content categories that correspond to five Underwater Encounters books: Sea Turtles, Clever Crustaceans, Treacherous Tentacles, Ocean Oddities, and Spines, Stingers, and Teeth. The hear-and-read activities are mini-books with text and photos taken from our 48-page readers. They highlight interesting facts narrated aloud. Clicking on the individual words in the text causes the narrator to repeat the word on its own, allowing children to closely associate the way the word looks with the way it sounds. The matching activities pull images from the related hear-and-read. Children examine the selected "card" closely, then try to find its match. This activity can help them learn to pay close attention to detail, sharpen working memory, and improve familiarity with the characteristics of the newly introduced sea creatures. Children can flip through stunning photography by widely published underwater photographer Robert Yin, giving them glimpses into the magical world under the sea! Each photo library has twenty to fifty colorful, fascinating photographs, featuring sharks, seahorses, squid, and more! See the sea from a diver's-eye viewpoint, complete wih scuba-tank breathing audio! Your children will love to spread to pretend that this app is a window to the undersea world and they are the divers! Short video clips show lurking sharks, teeming schools of fish, curious squid, and more! Bring out your child's inner artist with click-and-color drawings of the sea creatures from the books they've read. Simply click the palette to select a color, then click the image to color the area within the lines! Be realistic or fantastic! Choose from 4-, 8-, 12-, or 24-piece versions of puzzles made from gorgeous underwater photography. The puzzles are timed, so even after children have mastered a particular puzzle, they can get additional enjoyment trying to beat their best time! To learn more about the Underwater Encounters series that this app is based on, you can click here to visit our website or click the image below to download an information sheet with key features!